I can’t be the only one here terrified of clowns. And the recent emergence of clowns all over has done nothing to ease my fears. If you are like me you will probably be a little torn by this video. A car full of young men see a random clown walking down the street. They quickly decide to turn around and teach this clown a lesson. As they approach the clown they menacingly threaten him. The clown immediately responds by dropping what’s in his hands and backing up defensively. He begins telling them he doesn’t want any harm. But that doesn’t stop this belligerent young man. He pushes the defenseless clown down and begins to beat him severely. In the background you all you can hear are the young men in the car cheering him on for beating the clown to the ground. They pull away leaving the clown curled up in a ball on the ground. I am not sure what was more disturbing here. 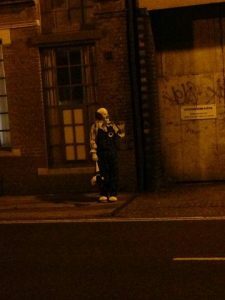 Was it the creepy clown on the side of the road who was absolutely terrifying? Or was it the carload of obnoxious men who went out of there way to find him and leave him beat up on the side of the street? If I am being completely honest here I would definitely consider the men in the car the most disgusting part of this situation. In my opinion the only positive that might have come from the creation of this video would be finding the boys in that car and holding them responsible. Honestly, this video definitely scared me. But not because of the clown. It is disturbing to see young men who are motivated by violence. Even to the degree that they would be willing to chase down a scared man dressed as a clown and beat him down. Watch in the video what happens. They are obviously pretty proud of themselves.